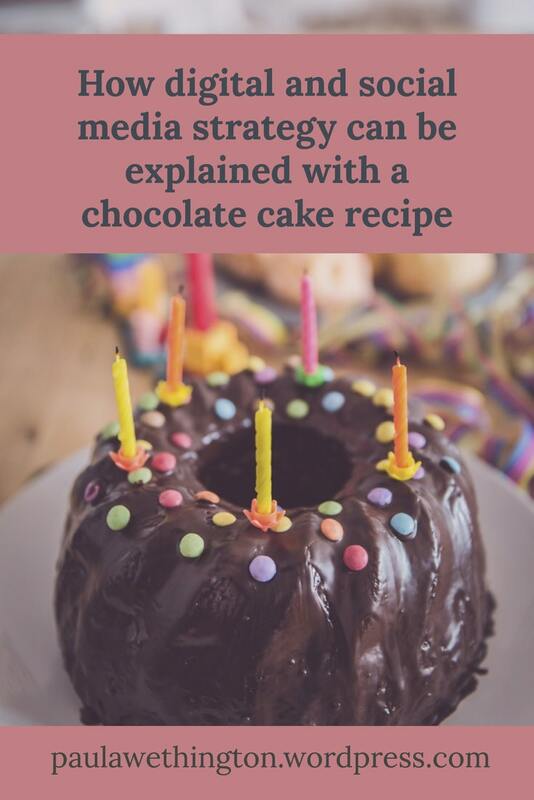 Digital / social media strategy is like a recipe for a chocolate birthday cake. If you do everything right, you create awesomeness that wins blue ribbons and bragging rights. But if you miss a step or key ingredient, the friends you are serving the cake to might realize it’s a bit off or they’ve had better. The challenge is they might not understand what is wrong with your baking creation; and even if they do, they might not tell you. If it’s really bad, they may politely ask for apple pie the next time you offer to make dessert. But unless you were paying close attention while assembling and mixing the ingredients, you might not figure out exactly what went wrong. Eggs = The basics: who, what, when, why, where and how and specific keywords. People use search engines to find answers to these questions. As a result, content, headline, subheads, description box and photo captions must be filled out with words and phrases that present the basic message. Butter = Accurate and reliable content is like choosing the very best ingredients in your cake. Just as you shouldn’t trade butter out for cheap margarine, don’t take shortcuts on research that becomes the foundation of your content. Explaining how and where you learned or found the information helps build trust factor among the audience. Sugar = Sweeten it up. Look for interesting topics, or an interesting angle on an otherwise routine topic. When you localize or explain national statistics with a reference to your community, it becomes more appealing to the target audience. They’ll be more likely to understand the core message. Vanilla = You’ll notice at the taste testing if vanilla is missing from the cake recipe. This is like failing to include an image or photo on a website story. Yes, technically, the cake will bake. Yes, technically, a text-only website post can be read. The reality in both situations is that missing it will not work as well. Photos grab attention on an email newsletter and on social media. Branded or one-off graphics are easy to make on a service such as Canva or Snappa if you don’t have photos or file art that fits. Bottom line: Don’t forget the vanilla! Flour = The flour in a cake represents reliability as it is a critical ingredient for the recipe. You apply the idea of reliability to website content by having the information available when people are looking for it. Plan ahead for topics that are recurring or seasonal; and act fast during breaking or trending news in your niche, to build the reputation of reliability. Baking soda = This ingredient makes the cake batter rise. But it’s a little box and a usually just a teaspoon, so it’s easy to forget. A detail in website programming that’s easy to overlook is adding alt tag descriptions to the images. You’ll understand why this detail is important the next time you hit “image search” when doing a Google search. Salt = Salt can help enhance the flavors of the cake when a batter recipe calls for it. Does your content call for the context of an author’s note to explain that this is something special or different? If so, add that. Cocoa = This is what makes the cake chocolate flavored and not vanilla. If you want your content to be “not vanilla” in comparison to what can be found elsewhere on social media on the Internet, then you explain the content a bit better, go more in depth or take extra effort in the visual presentation. This is what multimedia extras such as video or map embeds can do. People will linger a little longer on pages that have such content. Now it’s time for mixing the cake batter. While you do that, double check your list of ingredients to make sure you did not skip anything. Selecting the shape and size of the cake pan you will pour the batter into is like selecting what category keywords you want that content to be found under. The 8-inch circle pan size is the most common presentation; and maybe that’s exactly what you want. But a heart-shaped pan is a little more special. And the sheet cake pan bakes the treat in potluck party-friendly format. It’s going to be a cake. It’s going to be on your website. Yay! You can certainly eat an unfrosted cake after it is taken out of the oven. But you probably want icing on that cake. Think about this: If you offer a spatula covered with icing leftovers and a spatula covered with cake batter leftovers to a friend who is working with you in the kitchen, which one do you think will be grabbed first? This is what social media does to website content: social media attracts and interests a larger audience. Do some research on how much traffic comes to your website from social channels! It’s not all search engine traffic, although they do work hand in hand. Butter = Just as with cake, real butter in the icing mixture represents quality. Get your “quality” message across with coherent writing and appropriate visuals. Include a “call to action” if appropriate of what you want people to do after reading the message. Powdered sugar = Just like with website content, social media content needs to be interesting. That’s what sugar can do. But powdered sugar is not the same formulation as granulated sugar. Do some research on preferred writing and visual presentations for the social networks you are working in; it is not the exactly same as writing for SEO purposes. Paying attention to those little details makes a difference on the results you’ll get with your social media efforts. Cocoa powder = Cocoa powder is what makes the icing chocolate flavored and not vanilla. Brainstorm and settle into your unique perspective and brand personality so that you stand out from others who are posting on that same topic. Blend all that together and frost your cake! Now did you decide to put birthday candles or candies on that cake so it is extra special? Of course! It’s a birthday cake. You can also give your social media efforts an extra touch by creating a branded look to your social media. But now I think it’s time to make a cup of coffee to accompany my theoretical piece of chocolate cake! I work as a reporter and social media team member at The Monroe News in Monroe, Mich. Years ago, I really did win a county fair blue ribbon for a chocolate cake.